Spectators can expect to see dirt bikes 40 feet off the ground and jumping 75 feet in distance by the United FMX Stunt Team, who will be performing Thursday through Saturday at Baum Stadium. This will be a very exciting event for the entire family to enjoy! 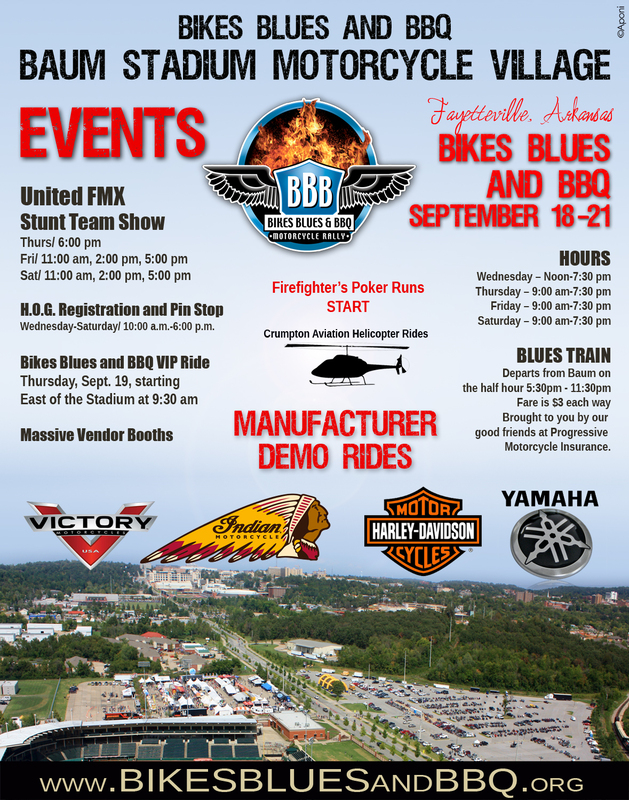 The Blues Train, brought to you by Progressive Motorcycle Insurance, will be running Thursday-Saturday of the rally. It will be departing on the half hour from Baum Stadium. Fare is $3.00 per person each way. There will also be tons of vendors, fantastic demos by Harley Davidson, Indian, Victory and Yamaha, as well as loads of food to choose from including Gyro's, burgers, brats, roasted corn, funnel cakes, Soul Food, tacos and much more!